The villa was commissioned from Palladio by the Vicentine Bonifacio Poiana, of a family most faithful to the Republic of Venice which, from the Middle Ages, had exercised a type of feudal jurisdiction over the territories which bore their name. Moreover, in the area where the villa would rise there already existed a Quattrocento farmyard dominated by a tower, where the family arms still stand. Palladio probably designed the villa towards the end of the 1540s, but works proceeded slowly. They concluded only in 1563, when the internal decoration was completed by the painters Bernardino India and Anselmo Canera, and the sculptor Bartolomeo Ridolfi. In both the Quattro Libri and Palladio’s autograph drawings preserved in London, the villa is always treated as part of a global project to reorganise and regularise the surrounding area into ample courtyards. However, only the barchessa to the left of the villa — with Doric capitals but Tuscan intercolumniations — was built according to this project. At a more general level, the complex was completed in the seventeenth century, when Bonifacio’s descendents adapted the building to their taste and needs, adding another block to the right of the villa which even quotes its window mouldings. Set far from the road, within a deep court, and flanked by gardens, the villa rises over a basement designed for its various service rooms. The principal floor is dominated by a great rectangular hall covered by a barrel vault, on whose sides are symmetrically arranged the minor chambers, all covered with differing vaulting. Evidently, Palladio’s source of inspiration was the ambience of the antique baths, and this holds for the elevations too: the great cornice, which describes a sort of interrupted tympanum on the faï¿½ade, derives from the perimeter wall of the Baths of Diocletian in Rome, as does the serliana, though this also reflects Bramante’s experiments with the configuration of a double arch and five oculi. 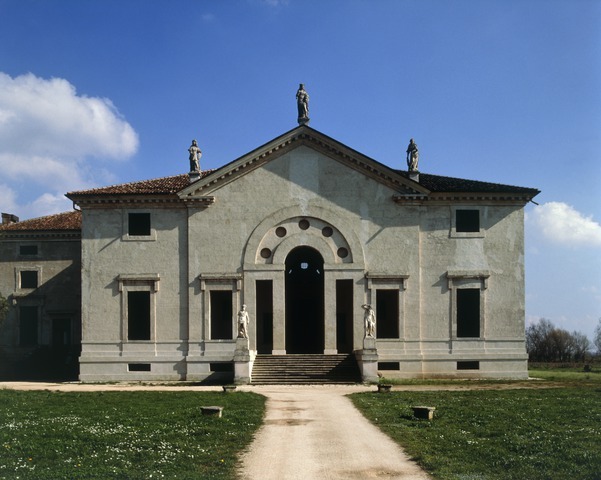 More generally, it seems that Palladio sought the utilitarian logic, so to speak, of antique thermal architecture through an extraordinarily synthesized and abstract, almost metaphysical, language of forms. Devoid of capitals and trabeations, the order is only just hinted at in the essential articulation of the pilaster bases. The absence of orders and of parts in draughted stone (excluding the portals of the loggia) must have assured an overall economy in the realisation of the work. This aspect is also confirmed by the use of rendered brickwork and profiled terracotta, on which a recent restoration has discovered traces of polichromy.